What better time for Love's Freeway's note cards and prints to make their debut in the non-virtual (i.e., 'real') world than in this month of Thanksgiving. I could not be more thankful for or more pleased with the reception we received. Thank you to Karen, Caye, Albert, Ginny, Mari, Deb, and all who came out to the Gamble Mansion on the 11th. Many thanks as well to Joan, Ellen, Martha, Faye, Nick, Patricia Sharon, and all the fine folks at Electric Insurance who showed their support and appreciation of Love's Freeway the following week. 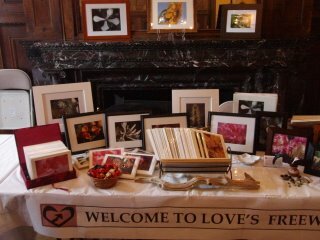 I extend special thanks to Karen and Ellen who purchased the centerpiece print at each of the two shows (left and center on the mantel above). Even those who weren't in the market for cards or prints stopped to have a look at them. Many complimented me on the photographs. 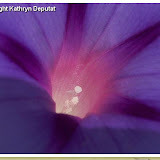 Some inquired about my background, my relationship to photography. Many showered me with praise; I balked at first at Albert's. "But I don't feel like it's my doing," I told him. "It's nature, just doing what it does. Amazing." "Yes, it's the Holy One at work," he replied, "but you do damn well representing it!" That pleased me a lot. Albert seemed to understand this notion of representation, of me as midwife versus photographer who has some claim or ownership over the work. 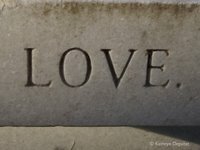 So to redirect attention from me (photographer) to the mission, I received visitors with a hearty "Welcome to Love's Freeway!" I offered them free packets of morning glory seeds which I'd harvested from my own vines a couple of days prior. 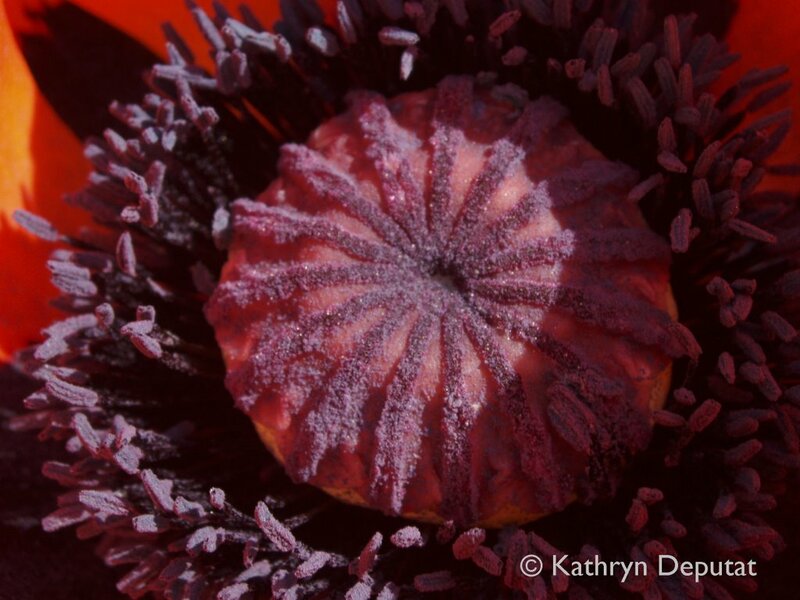 For me, the seeds represented the true spirit of Love's Freeway. It tickled me that customers and browsers alike delighted in taking them home for planting, along with my precise instructions to "toss them on the ground now, let winter do its thing, and just be sure you don't pull them up as weeds next spring ." 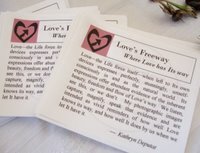 I also invited one and all to take a sheet bearing the motto and mission of Love's Freeway, as well as (on the reverse) links, contact info, etc., and I printed up excerpts from this blog which were available for the taking too. I spent time over the holiday with family and friends in Virginia who have encouraged me to introduce Love's Freeway down their way. First stop was Old Dominion University in Virginia Beach, where I viewed an exhibition of Helen Jones' work, and considered the space for a future exhibit of images from Love's Freeway. Next stop was Sandbridge where I met Nicole, a healer/guide who viewed a sampling of cards and while doing so grew increasingly enthused about the possibilities for their use. She readily saw prints of them hanging in the holistic healing center she is planning to open, and she saw (and subsequently demonstrated) how the images could help yield powerful readings, as well as aid in representing and reflecting (by color) the chakras. A conversation with Lynne our host pointed me to the A.R.E. and the Heritage Holistic Center as potentially receptive hosts to Love's Freeway's mission, products and/or services. And Richard and Tracey (thank you both) were inspired to purchase several cards for gift giving! A tour of the Norfolk Botanical Garden yielded the newest images for the collection, which are in queue for printing, mounting and framing. One in particular seems to me an obvious candidate for use as a poster-sized print to represent the Garden in some fashion, or perhaps to hang in their Visitor's Center. My final stop this trip--a million thanks, Trace, for your vision and support all along the way--was Prince Books in downtown Norfolk, where I was warmly greeted by Brian and Ali. They took their time looking through the cards I'd brought, liked them a lot, and encouraged me to follow up with a call to the owner. I did so immediately upon return to Boston and as the store is doing no buying until after the holidays, we'll have to continue the conversation in January. 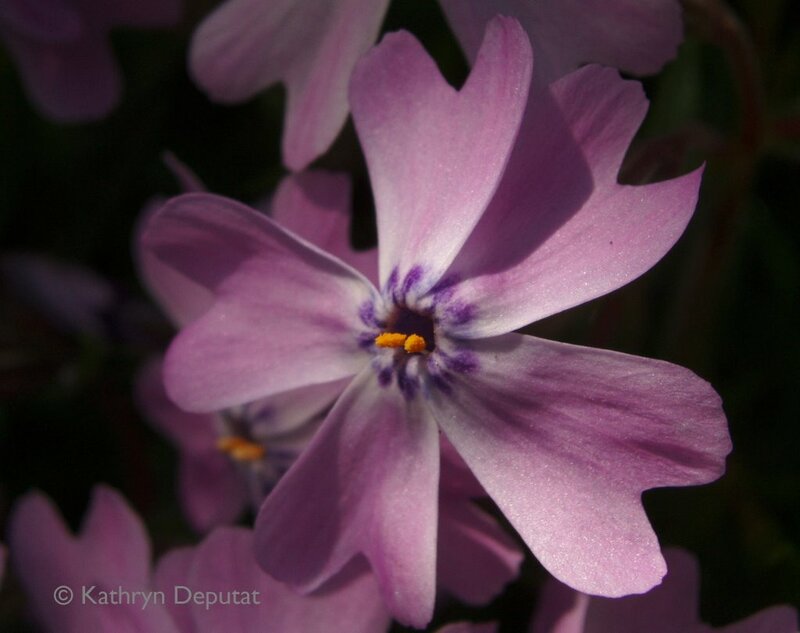 But in the meantime, Love's Freeway remains in their midst by way of one representative card that Brian chose at my invitation: this close up of a single creeping phlox, with its own little world in there. His enthusiasm for the "View from Thoreau's Cabin" card also got me thinking about enlarging that one for hanging--in Prince Books or in another such Bookstore/Cafe. Through all this exposure and expansion, it became clear to me how easy it can be at first (or even second) glance to suppose that Love's Freeway is just about pretty cards and buying or selling them. I have not always succeeded in making it immediately apparent that there is something else afoot. And that leaves me newly committed firstly to annotating each card, so people know the story of what they're looking at (for each image does have a story, which I notice I am wont to tell when I present the cards in person). And secondly, I am renewed in my passion to create a book of words and images which I envision as a backbone of sorts to the body of this Freeway--and key to its further expansion. But first, there is the matter of immediate accessibility to all who (like Sarah Prince Pishko of Prince Books, who rightly asked about a website: "One card is not a selection...") seek access to the ever-growing collection of Freeway images. (Web master elves? To task! To task!) 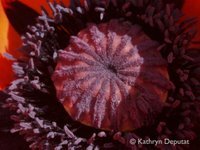 But in the meantime, I have here hundreds of beautiful, evocative images mounted on fine paper, or in some cases, matted and framed, which all exist to be living reminders of Love's way in the world. They're ready to go, and they don't understand the logic of waiting for other steps to precede their release. 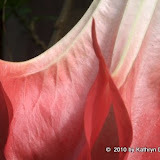 And I'm so itching to share with all within reach of this page the wealth of beauty, inspiration, passion, and enrichment--the deep breaths and ahhhhs, the essence of the Freeway--that those who visited or were visited by it this month have enjoyed. It thrills me to no end to see people touch and be touched by Love's way. Addendum: Just as I was putting the finishing touches on this entry, the phone rang. The caller asked if I wanted to show my work March 29 through April 30. I had completely forgotten to mention here that on the way home from the Gamble Mansion debut, I stopped for a haircut appointment--full of the excitement of the day, with sample cards in tow to share with my stylist. While changing clothes, I noticed a call to artists hanging on the wall that I'd seen before, but this day it stood out. I asked the woman at the counter about it, and fanned out the cards when she asked me what I'd show. She 'happened' to be the woman in charge of booking artists, and, visibly impressed by what she saw, took down my name and number. She said something looked likely for spring, probably May of '07, and that the cards would be a great addition to the salon's part in "First Thursdays". But here she was calling today and proposing a solo show, which is now officially booked! This synchronicity, this gorgeous flow heartwarms and humbles me. When one's agenda is Love, clearly there is always room at the table. 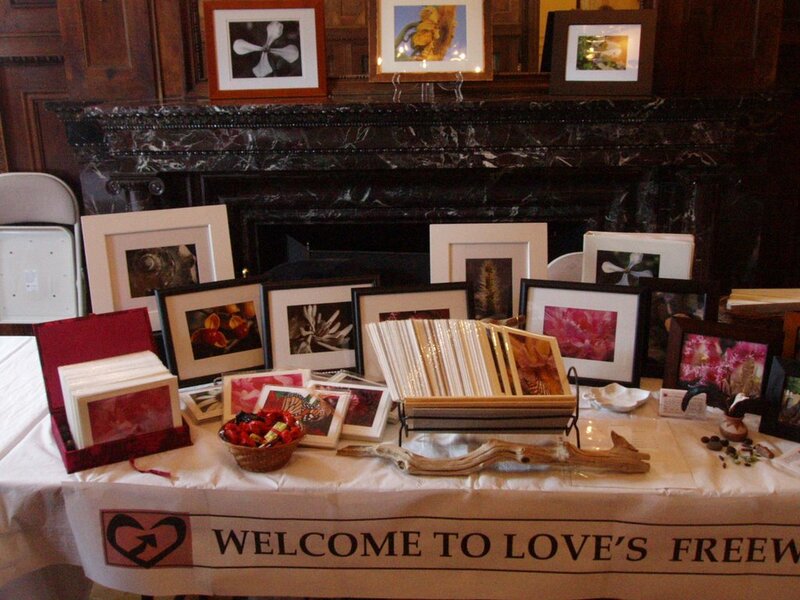 Images from Love's Freeway will be on display this weekend!! 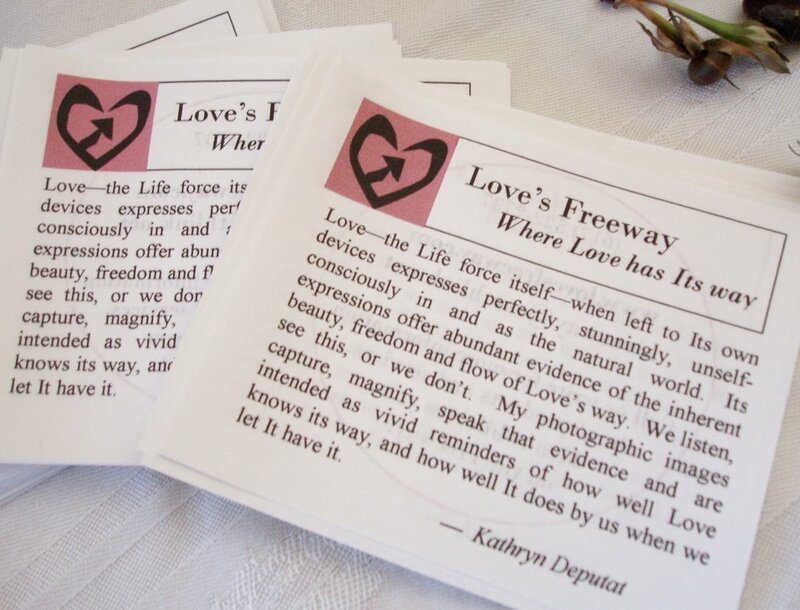 For the first time, original Love's Freeway note cards and prints will be available for viewing and for purchase this Saturday, November 11, in the Ballroom of the Gamble Mansion. Come on down to 5 Commonwealth Avenue--a stone's throw from the Boston Public Garden--anytime between 10 a.m. and 3 p.m. to feast your eyes! To feel the Love! To share the Love! This milestone is occurring in conjunction with the 2nd annual BCAE Holiday Sale, which will also feature pottery, jewelry, chocolates, holiday ornaments, stained glass, spices and sauces, plants, scarves, and more. I did not seek out this show; it came and found me. And I signed on within minutes of learning about it. 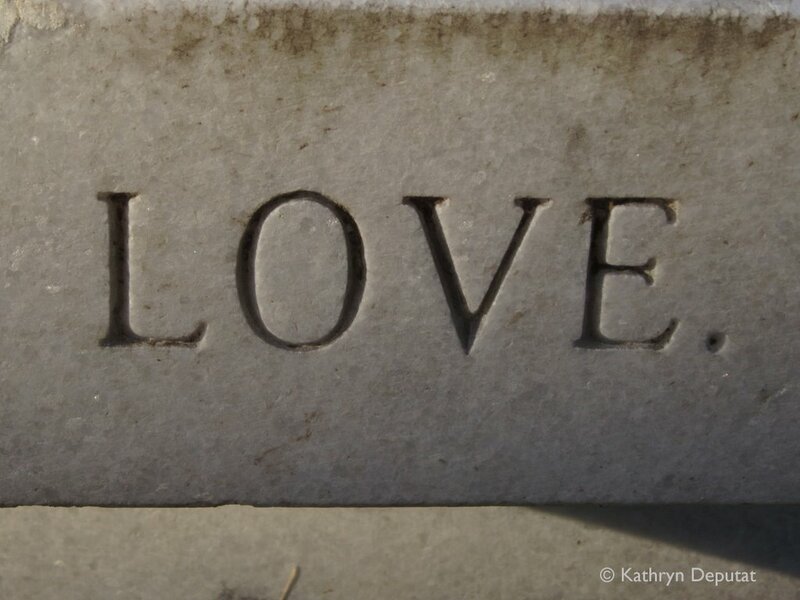 Count all this as another great big chunk of evidence for how well Love knows its way! I do hope you'll join in the celebration on Saturday--in spirit, if not in body.